Live Monitor is a technology designed to gather information relevant to drive status, including operating hours, unsafe power downs, and temperature. With recent advancements in technology, SSDs are being widely adopted in industrial applications, and Live Monitor attributes are being developed to match specific needs. For industrial and cloud applications, ADATA has developed two sets of Live Monitor attributes. The first reports NAND Flash information. 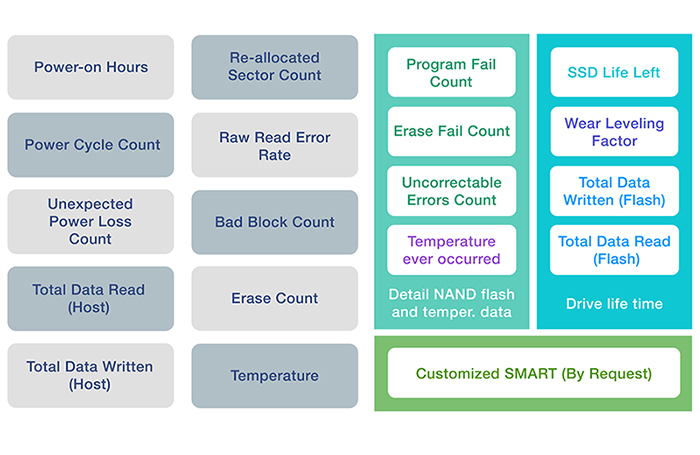 By using the specified Live Monitor attributes, users can easily access core SSD NAND Flash information, including bad block reports, erase count, and program/erase fail. The second Live Monitor attribute set relates to reliability, whereby a user can easily access drive lifetime, wear-leveling factors, and total data written – used to evaluate Total Bytes Written (TBW) and Drive Write per Day (DWPD). This information is useful in predicting overall SSD lifespan and preventing sudden data loss. ADATA provides useful Live Monitor capabilities specifically developed for industrial applications so that customers may have more transparent and complete information to fully manage SSD assets.